Gladys Reeves, circa 1915. Provincial Archives of Alberta, A14076. Just as importantly, the earliest archivists and some government leaders understood the enormous value of this visual history, and had the foresight to establish repositories for the collections. Today many of those images remain accessible from the holdings at the City of Edmonton Archives, Provincial Archives of Alberta, the University of Alberta, and the Glenbow Museum in Calgary. Here’s a look at some of Edmonton’s remarkable pioneer photographers — and the images they captured. Charles Wesley Mathers. Provincial Archives of Alberta, B4242. Vegetables from Donald Ross’ garden, 1902. Photo by Charles Wesley Mathers. Provincial Archives of Alberta, B9021. William Hanson Boorne and Ernest Gundry May established what may have been Edmonton’s first photo studio in 1891 at 9666 Jasper Avenue. The partners hired the 24-year-old Mathers for their Calgary operation in May 1892 and later that year convinced him to oversee their Edmonton location. He immediately took to the burgeoning settlement and in February 1893 purchased the studio from Boorne and May. It was a tiny little place, barely 12 feet by 18 feet, with living quarters above. In April 1901, Mathers travelled north from Edmonton to Athabasca Landing and then down the river into the McKenzie and to Fort McPherson on the Arctic Ocean. His return in September generated a huge amount of public interest and the Edmonton Bulletin kept its readers informed of his progress processing the glass negatives into prints. The story went on to say that the images would be “the only views taken in the north country by a professional photographer using the latest and most complete appliances.” Those photographs were to be published around the world — the first such ever seen by thousands of people. The urge to travel and photograph what he saw took Mathers over, and in June 1904 he sold his portrait business and studio to his assistant, Ernest Brown. Mathers travelled down the Saskatchewan River to Fort Pitt (Lloydminster Landing) to Battleford and then settled in Vancouver the following year. He moved to Taft, California, in 1920 and died there in 1950 at the age of 82. Mather’s photographs of Edmonton and area bought by Ernest Brown are part of the Ernest Brown Collection at the Provincial Archives of Alberta. Other artifacts from Mather’s time in Edmonton may well exist in collections in California or in the hands of relatives. Ernest Brown, Provincial Archives of Alberta, B4240. Ernest Brown Block, 1914. Glenbow Archives, NC-6-1165. Eager to ply his trade on the Canadian frontier, Brown arrived in Edmonton on April 18, 1904, from Newcastle, England, and began working for Mathers. Three months later, on July 1, 1904, he purchased the business and its already substantial collection of images, which dated back to 1884. As the city and the business grew, Brown decided that a bigger building was in order. He demolished the old one at 9666 Jasper Avenue and in 1911 began work on a three-storey brick and steel structure that fronted 33 feet of the north side of the avenue. “Everything Photographic. Ernest Brown Block 1912,” read the inscription on the parapet. The ground floor of the Edwardian Commercial-style building housed Brown’s portrait studio and other businesses including a printing and stationary store and a men’s clothing store. His enlargement department and picture framing factory were located in the basement, while the upper floors were offices and apartments. The following year, an addition the same size was constructed adjacent to it, making the total frontage 66 feet. Brown’s business flourished for the couple of years but then faltered during the First World War. He was foreclosed upon by the Dominion Life Assurance Company in 1920 and Credit Foncier took title to the building. Its name was changed to the Brighton Block, and it survives to this day. In 1947 Brown sold his collection of more than 50,000 negatives and 11,000 prints to the Provincial Archives of Alberta. The collection comprises photos he took, along with those of more than a dozen pioneer photographers, including Boorne, May and Mathers. Brown died on January 5, 1951, at the age of 73. The photos, the Highlands house he called home around 1919 and the Ernest Brown Block have survived to provide a remarkable snapshot of a time when Edmonton was a booming city, reaching earnestly for the future. Unidentified woman and child in a gazebo at the Edmonton Golf Club, circa 1913. Photo by Gladys Reeves. Provincial Archives of Alberta, A7413. Gladys Reeves was born in 1890 in Somerset, England, and moved with her family to Edmonton in 1904. She was barely 15 when she began work as a receptionist for Brown in 1905 at his Jasper Avenue office. It was the start of a 46-year-long collaborative partnership. 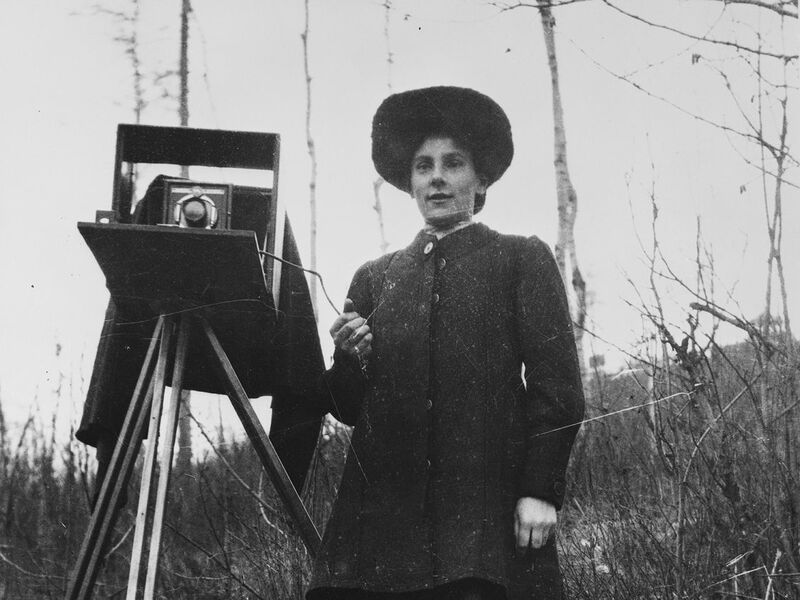 Reeves established her own photographic studio in 1920 called The Art League, and was reputed to be the first woman west of Winnipeg to operate her own studio. Nine years later, fire destroyed the studio and its contents, which sadly included many of Brown’s negatives that were being stored for him while he worked in Vegreville. With help from Brown and her colleagues, Reeves got her business going again with a studio over the Empress Theatre at 10131 Jasper Avenue. The studio remained open until 1950, offering commercial photography and portraiture. Together she and Brown developed a school program using his collection of historical photographs. Reeves was renowned for her community work, and her interest in gardening and horticulture. For more than 20 years, she served as a board member of the Edmonton Horticultural Society and in 1928 became the society’s first woman president. She was also a driving force behind the Edmonton Tree Planting Committee, which coordinated the planting of more than 5,000 trees on boulevards in Edmonton in 1923. She died in Edmonton on April 26, 1974, at the age of 83. Like Brown, her collection of documents and images was acquired by the Provincial Archives of Alberta. Other early Edmonton photographers included Mortimer Burgess, who arrived from England in 1906, and Percy Byron and Gustave May, who started their Byron-May Company in 1907. Frederick Glen McDermid’s McDermid Engraving Company went into business in 1913, Alfred Blyth began taking photos in 1917, and Hubert Hollingworth was snapping shots by 1924.